The South Wind was originally composed in about 1899 as a setting of Heinrich Heine’s poem ‘Die Lotosblume’, but as Ives noted in 114 Songs he felt ‘the setting was unsatisfactory, and other words were written for it’. This was a new poem by Harmony Twichell, soon to become Ives’s wife, and the re-casting took place in 1908. Nevertheless 114 Songs prints the two texts as alternatives. 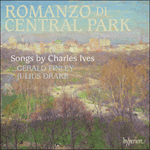 Gravely expansive, this is one of Ives’s finest homages to the spirit of post-Brahmsian Romanticism. The South Wind («Le vent du Sud») fut originellement composée vers 1899 sur «Die Lotosblume» de Heinrich Heine mais, comme le révèlent les 114 Songs, Ives sentit que «la mise en musique n’était pas satisfaisante et d’autres paroles furent écrites». Cette refonte eut lieu en 1908, avec un nouveau poème d’Harmony Twichell, qui allait bientôt épouser Ives. Reste que les 114 Songs présentent les deux textes, au choix. Solennellement expansive, cette œuvre constitue l’un des plus beaux hommages ivesiens à l’esprit du romantisme post-brahmsien. The South Wind wurde ursprünglich um 1899 als Vertonung von Heinrich Heines Gedicht „Die Lotosblume“ komponiert, aber wie Ives in 114 Songs bemerkt, fand er „die Vertonung unzulänglich und andere Worte wurden dafür geschrieben“. Diese Worte waren ein neues Gedicht von Harmony Twichell, die bald Ives’ Frau werden sollte, und die Neugestaltung fand 1908 statt. 114 Songs druckt jedoch beide Texte als Alternativen. Dieses gravitätisch-expansive Lied gehört zu Ives’ besten Huldigungen an den Geist der nach-Brahmsischen Romantik. Where long a tree has stood. Looks up his old love’s face. Through her brief day has shone.